Our three cogs approach has long been a part of our thinking and it does seems to help when trying to change operators' thinking towards on-line marketing. Build your site; Develop your relationships, Maximise your conversion. It sounds simple and in actual fact much of it is simple. You can't rely on any one area of your digital presence to do everything for you but create a focussed and achievable plan and you can build more of that all important low cost DIRECT business. Implement these three basic rules and there is little doubt that you can start moving the customer away from those pesky, expensive OTAs back to booking more rooms DIRECT. Best rate and maximising availability are maybe more easily understood but what does Reduce Friction mean and how do you do it? Well, basically it means taking the customer from where they are to where they want to be as simply and quickly as possible. If we use an example of an event package within your property "reducing friction" would include the following. You are selling a new series of music based packages with dinner, bed and breakfast to fill shoulder rooms. 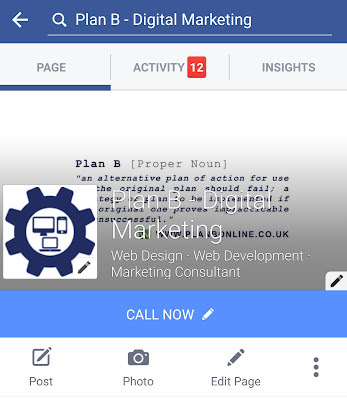 It is all about content and in this context that is both booking engine content and webpage content. You must have both - a dedicated Music event page is needed for search and focus whilst without online availability it will never convert. Tick the above and you will have reduced friction quite dramatically and if the product and pricing is right you will see increased uptake and conversion. However as we all know, not all booking engines are equal. Yes it may integrate directly with your PMS or even be good for managing channels but in all honesty is it easy for the customer to book or for you to create packages like the one above? Room types - standard, suites. single, executive. Your Bookassist online manager will provide you with a list of your "price groups" and web links connecting to each offer directly for you to drop into your online marketing campaigns. Simple and effective and at every stage reduces friction and increases the chance of conversion dramatically. Have a look at exactly this with one of our favourite hotels in Scotland, the five star luxury Lochgreen House Hotel overlooking Open Championship venue Royal Troon. Click on the Feature to the right and maybe you'll even Book a night out in Ayrshire! If you recognise that you need to take your own bookings back, and to paraphrase a rather large hotel group stop your customers clicking about, then give us a call on 01294 233713 or email us directly to find out how Bookassist can improve your conversion rates. The luxury Bed and Breakfast is located in Linlithgow, near Edinburgh, nestled deep in the heart of West Lothian, Scotland. Belsyde Estate, Linlithgow is an idyllic country retreat,set in 105 acres of stunning wooded sheep farming land and offers panoramic vistas as far as the eye can see. The new site is based on one of the Open Rooms themes and as well as having full control over content the site also integrates the Bed and Breakfast's blog and social media, integrates their Freetobook booking engine to drive DIRECT bookings and allows easy page and image management with the easy to use content management solution. Two years ago I, foolishly, decided to start putting live music on at The South Beach Hotel in Troon - we call it South Beach Sessions. Since then we've lost far too much money but had a ball doing so in the company of Grammy winners such as Albert Lee and John Jorgenson, herpes of my youth such as Whitesnake legend Bernie Marsden and some wonderful bands including The Chaplins, JJ Gilmour, and Bernie Torme! The latest wonderful experience was last Sunday night with "The Goddess of Soul" Dona Oxford. With her talented young band she treated the audience to an evening of soul, blues, gospel and an astounding chunk of Boogie Woogie. It had to be shared. But here's the plea, music promoters all over the UK are struggling for any number of reasons but the next time you see someone putting on live music in your location please think about supporting it. You can be assured that they are doing it for love of the music and not for the money and supporting local business is not just about buying some beef olives and steak pie at the butchers - Live music needs an audience and small venues can offer the most amazing experiences too. Click if you need proof and enjoy! Alba Golf in Fife have launched a brand new website focussing solely on their personalised golf tour business. Owner Christine Seaton has been involved in the golf sector for more years than she cares to admit too and is a well known face at Scotland's top hotels, resorts and golf courses. Christine has been out on her own operating Alba Tours for a number of years specialising in independent groups and packages for the Edinburgh tattoo. Golf has always remained a part of the overall mix but for 2016 it was felt that the golf section needed a presence of its own hence the launch of Alba Golf. The site is a simple site reflecting the quality ethos of the business. Christine offers a bespoke highly personalised service for limited number of golf groups every year with her personality central to every communication, itinerary and recommendation. We have helped not only with the sourcing of imagery but assisted in content writing and giving the site a personal feel that may distinguish it from other larger more corporate offerings. The site is powered by our own Claymore Content Management Solution and allows full control over content, full page images, headers, features and event the creation of an image gallery on every page. The site allows for the addition of new golf and hotel partenrs as required and the integration of blog features and even the creation of itineraries and programmes. Using our own Content Management Solution allows us to develop useful tools which can then be used by other clients. The new itinerary planner function was built as part of the project for Hebridean Cruises but was developed to be a fully operational tool for other tour operators and travel professionals. It means that with a simple click and add travel websites can add their own personalised itineraries and tour programmes. Following on from the highly acclaimed launch of the Scotland's Best Bed and Breakfasts website earlier this year we have been helping some of the association's members improve their own web presence and are delighted to have been involved in building a brand new site for Dunfermline four star Bunree Bed and Breakfast. Owners Hamish and Una Donaldson, contacted us after the SBBBS launch and decided to go with our Open Rooms Standard package based around one of our Themed designs. The couple had an old website which they couldn't update and didn't have any control of imagery or content. The new site allows the couple to manage not only their page content but add image galleries, change headers and add their own promotional features all year round. 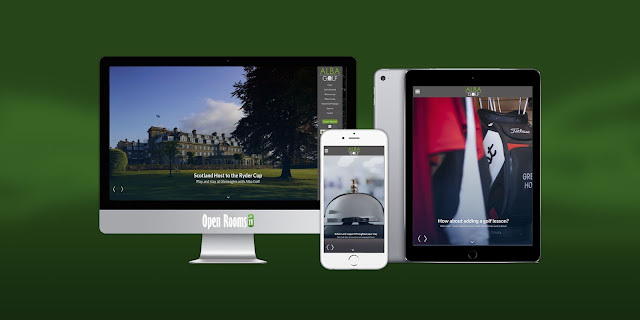 Open Rooms website packages are all fully responsive as standard, working equally well on mobile, tablets and desktop - something that is now no longer desirable but critical. The B&B use Freetobook for their booking engine and the link to the booking page was embedded prominently into the site to encourage more direct bookings. The Open Rooms Standard site is the most popular package that we offer to guest house and bed and breakfasts and ensures that as well as offering a content managements solution that has been designed for the hospitality business owner it provides support in helping market more effectively on and off line. It is not just about building a site then walking away. As well as providing the "how to" we also try to teach the "why" as well. We explain the benefits of good content, strong destination imagery and make things like search tags easy to understand. We emphasise the need to keep building relationships through newsletters, social media and other distribution channels and of course reducing the cost of bookings by converting more DIRECT bookings is very relevant to all accommodation businesses regardless of size. Taking B&B Web Design to New Heights? Following the launch of the very well received Scotland's Best Bed and Breakfast website late last year we were delighted when several of the members of that group got in touch to have their own website redesigned. The beauty of working with a membership organisation who have quality control built in as standard, is the assurance that you will be working with businesses and business owners committed to going the extra mile. When building a website it makes it so much easier when you know have an accommodation product that can be positively reflected in the design. Westerton Bed and Breakfast in Callander is undoubtedly a perfect case study. Opting for our Open Rooms Standard which allows for up to a dozen content managed pages, the site perfectly showcases not only the accommodation but the magnificence of its location. The site uses one of our Open Rooms themes which are then tailored to fit each business as required. When designed properly "templates" should not constrain your online presence but instead can enhance it by allowing you to express yourself where it matters with unique, imagery, content and direct pricing. Our low cost set up fees make quality design and improved distribution accessible to all businesses and the "no lock in" monthly payment option ensures you never need feel tied to a web design company again - although we are sure you'll stay anyway! Thanks again for your help, we are really excited about seeing our new website going live. For the first time since we started the B&B 14 years ago, we feel we have a website which does our business justice. Your service has been amazing and it’s great to deal with a company which cares about its customers and goes the extra mile to meet the client’s requirements. There really is never a fanfare for these things and if you are not watching for them or listening to a good account manager you will probably have missed the launch of Destinations on Google. It's designed to help you discover and plan your perfect vacation on the go by doing the heavy lifting for you. Simply search with Google on your mobile for a state, country, or continent you'd like to travel to and add the word "vacation" or "destination" to get the stuff you need at your fingertips. The service is accessed through a standard Google search on a mobile phone’s browser or on the Google Mobile app. A search such as the one we have done for Destination Scotland will bring up a choice of popular locations; you can then click the more button to view the less often searched locations. We mined downwards for Ayrshire and that in itself shows both the pluses and minuses for the process as it stands but what it does highlight is the need for tourism operators to have control of their Google My Business area - the destinations information is powered by a number of Google applications and Maps is certainly one of them. We are still surprised at how many businesses have not claimed their business entry on Google (it's the map and details on the the right of every page) and every time we start a website or review a digital strategy it is the very first thing that we resolve. How do you know if it's yours? Simply search for your business name along with your town and you will see the map, images and details appear on the right hand side of the page. If it says "Claim this Business" just get it done as soon as possible. We have a attached a briefing document for you to download to allow you to do it quite easily for yourself or contact us and we'll do it for you. When setting up Google My Business for our clients we will go through the process to ensure the business makes best use of all of the free Google tools including Maps, Google +, update and upload your images, profiles, content descriptions and even set up your YouTube channel too. It is quite simple for most businesses to manage on their own and their is strong Google support too however we have came up against plenty of instances where Verification Codes go awry or support from Google proves less than helpful! Regardless of how you set it up, project releases such as Destinations on Google ensure that you must have your information up to date. 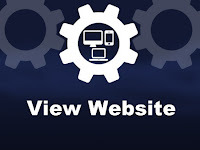 It is a free route to your website and cannot be ignored. 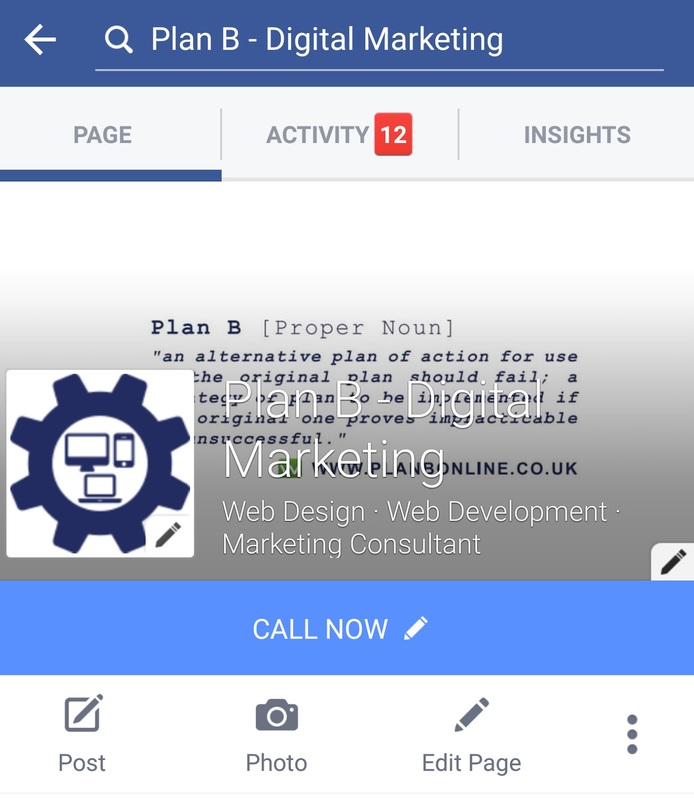 You may have noticed that Facebook have added a Call Now button onto your business page. It doesn't seem to be universally rolled out amongst all of our clients so if you don't have it already it's sure to be on its way. Just keeping logging in and make sure it sits beside your Book Now call to action that is already in place. Nothing much to the call now, but you need to ensure that your details are correct and that the phone is being directed to where it should be and not to some unfortunate in the accounts office getting a thousand calls on your three night spring offer! It's probably more relevant and certainly prevalent on mobile as that's where it's most likely to be used. The call now sits prominent under the main graphic so may actually generate some direct calls - probably worth highlighting in your social media and links. Take five minutes to update now. Malcolm Roughead has communicated this morning that VisitScotland have appointed a new Chairman to follow Mike Cantlay. And he's titled! Not being in the slightest churlish but it does seem to be that losing a LIberal Democratic seat shouldn't be seen as a barrier to future position! Anyway we wish him luck with his endeavours and here's hoping that his liberal leaning will move the organisation away from centralisation and control to increased collaboration and genuine moves towards sharing materials and solutions more widely. 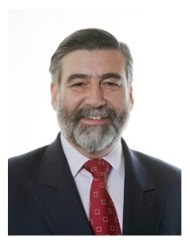 "I am delighted to inform you that Fergus Ewing MSP, the Minister for Business, Energy and Tourism, has this morning announced the appointment of Lord Thurso as the new Chair of the Board of VisitScotland. Boasting significant industry experience, John became Europe’s youngest 5 star hotel manager when appointed Managing Director of the Savoy Group’s Lancaster Hotel in Paris at 27. Following five successful years in Paris, he then led a number of hospitality businesses to success including Blakeney Hotels of Cliveden, which became the UK’s highest rated hotel under his leadership, East Sussex National Golf Course and Fitness & Leisure Holdings. John has served as a non-executive on a number of public company boards including The Savoy PLC, Millenium and Copthorne PLC. He is also Chairman of his family company in Caithness and for many years owned The Ulbster Arms in Halkirk. He sat in the House of Lords between 1995 and 1999 and from 2001 to 2015 was MP for Caithness, Sutherland & Easter Ross. He was awarded a “Catey” for services to Tourism 2003, was made an honourary DBA by Oxford Brookes in 2004, is a Master Innholder and a Fellow of The Institute of Hospitality and is President of the Tourism Society. In 2014 he was made a Privy Councillor by The Queen. John will take the reins from Mike Cantlay OBE, who has led VisitScotland through significant tourism milestones since his appointment in 2010 including the Glasgow 2014 Commonwealth Games, the Ryder Cup, a momentous partnership with Disney•Pixar on the blockbuster animation Brave and six themed years including the second Homecoming Scotland in 2014. Mike will step down as VisitScotland Chair on 31 March 2016, with John being appointed to the position for three years from 1 April 2016 to 31 March 2019. Plan B By The Sea - Three coastal hotel sites go live. It's been an incredibly fast paced start to the New Year with website after website and project after project reaching fruition but the past week has been especially busy with no fewer than four sites going live and major upgrades to our server and content management system rolling out at the same time! I was at a Team North Ayrshire conference last Friday at this wonderful venue just south of Seamill and the investment put into it by the Simpsinns family business is impressive. The event hosted the Depute First Minister who really was fighting with the magnificent views across the Firth of Clyde towards Arran, The backdrop of blue skies and flat calm seas combined to make the economic presentations just a little easier to understand! However it did emphasise that the work that we had done on the new hotel, restaurant and venue site really did benefit from the quality of the location and the professional photography taken of it. The new Waterside site was rolled out about six months ago but with some changes to photography and some work on the group branding we wanted to make some positive changes. The new site still benefits from full screen imagery on the home page with multiple feature boxes highlighting key events and calls to action with image galleries across all pages. A new footer was added (which will be adopted in the sister sites at Gailes Resort and Old Loans Inn over the coming weeks) and the integration of a bespoke coded availability checker as well as some subtle changes to the navigation bar. In addition the site is now benefiting from major changes to the security and upload of our servers with Content Delivery Networks improving global delivery and a number of new functions improving the speed of the page load dramatically for desktop and mobile. Everything is content managed from our proprietary Claymore system and changing images, titles, tags, content and promotions has never been easier. The site is one of our new Open Rooms Suite packages with a single set up fee and then recurring monthly charges of £120 plus VAT per month - it's contract free and benefits include a redesign included at the end of year two. There is a coastal them to all of our new hotel sites this week with each one of them sitting on a different Scottish sea! The Royal Golf Hotel benefits from magnificent location close to the wonderful stretch of Dornoch Beach and views across the Dornoch Firth - as well as sitting right on the first tee of the famous Royal Dornoch golf course. We have been working with the Royal Golf on delivering digital solutions for close on a decade and in that time have helped not only with their website but in providing their booking engine (Bookassist), content writing, email marketing and strong account management. We have built up a very strong relationship with their management team, so when we got the go ahead to rebuild the site we went full steam ahead turning it around from get go to go live in less than ten days. 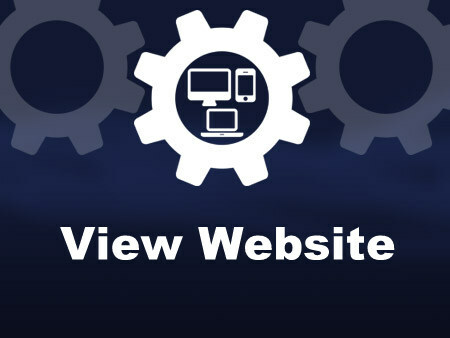 Using one of our "Themes" (or "Website Views depending on what day it is!) the site was again built using our Open Rooms Suite package and includes Bookasssit as the booking engine, integrates ConstantContact for the email marketing and data collection and features a new image gallery layout. We helped with content edits and search tags and uploading images - although all of these tasks are now being handled by the team at the hotel directly. We think the new site not only markets the hotel more effectively across all devices but undoubtedly promotes the attractions of the destination too. The final coastal destination of our business week is another quite unique property and the one quite clearly closest to the water's edge! The Crusoe Hotel is located right on the harbour and as can be seen above seems to sit in rather than next to the sea! Lower Largo is famous as the seventeenth century birthplace of Alexander Selkirk who provided the inspiration for Daniel Defoe's Robinson Crusoe and today you can locate the signpost pointing to Juan Fernández Islands 7,500 miles away where Selkirk lived for more than four years as a castaway! Anyway, back to this unique family run hotel and the new website. Another Open Rooms Suite package built to convert direct room sales. The site is built using one of our themes but as ever is highly personalised with a really nice "olde worlde" cartography background and wood carving style for the maps. 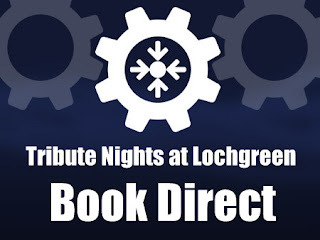 The site makes great use of our content managed features highlighting exclusive offers and linking directly into the Bookassist booking engine which is fully integrated into the site. So that was part of our week this week. Three hotel sites live plus another one for Kilmarnock Barassie Golf Club and ongoing work on a few more. If your hospitality business is in need of a digital refresh drop us a note and we'll give you a call. Contact us on 01294 233713 or email us directly. We believe strongly that quality and engaging content is the most important area of your online marketing strategy and that without it you have no differentiation from competitor businesses and destinations nor unique attractions for customers. However there is still a role for understanding the mechanics of traditional SEO. The title for your homepage can list the name of your website and/or business and could include other bits of important information like the physical location of the business or maybe a few of its main focuses or offerings. 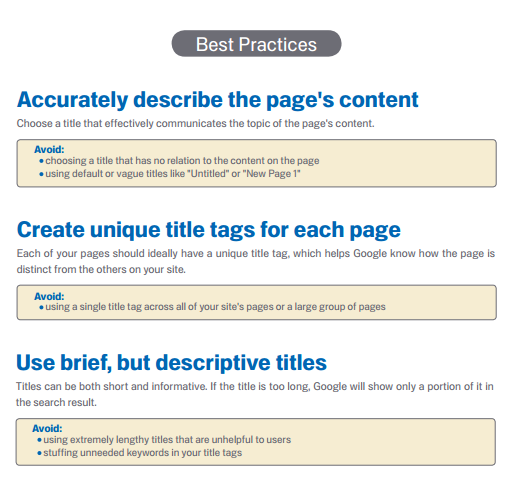 The following best practice guide comes direct from Google. A page's description meta tag gives Google and other search engines a summary of what the page is about. Whereas a page's title may be a few words or a phrase, a page's description meta tag might be a sentence or two or a short paragraph. It is understood that Google may not use this for actual searches but it is recognised that browsers my use it to ratify their search. Whilst not as important as the title tag, description meta tags remain relevant because Google might use them as snippets for your pages. Note that we say "might" because Google may choose to use a relevant section of your page's visible text if it does a good job of matching up with a user's query. 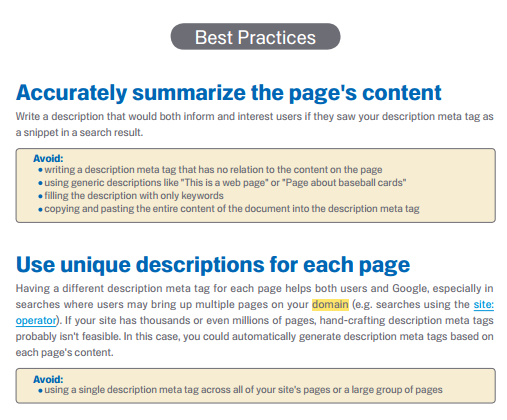 Adding description meta tags to each of your pages is always a good practice in case Google cannot find a good selection of text to use in the snippet – perfect for pages with high visual low word content perhaps. Again the best practice below is lifted from Google’s own SEO guide. "VisitScotland has today launched a new global campaign which invites people from around the world to experience the Spirit of Scotland - and it wants you to get involved!" says the press release! Having only had a few minutes to read over what is being launched there is a sense that the concept has the potential to bind not only tourism businesses across the country but be used alongside inward investment campaigns and overseas trade missions to emphasise not only the benefits of visiting Scotland but studying, living and investing here. It is however only a platform but it is a platform that appears to have many of the tools the industry needs to build more direct business. Videos and imagery, social media hooks and strong consistent messages that if used by tourism businesses and destination management organisations across the country with their own personalised and localised messages could provide the coherence, the glue to promote the Spirit of Scotland more widely. And it is undoubtedly that spirit that we all need to promote. Globally it's not about Ayrshire and the south west nor East Lothian and the Golf Coast. It is about Scotland and that unique essence that this campaign is trying to build upon. Use the words and strap lines that are being provided and used in the promo materials. You can be guaranteed they are going to go viral. Make sure you give your website a chacne of being found for them. Use the message and its tone in your writing too. The reason those words have been selected is that research indicates they engage. Drop the message into your social media headers, email signatures, web footers, and even your check out invoices and PDF brochures. and even if I personally find the #scotspirit a little cheesy the benefits may outweigh the cliche so use the hashtag! It is not a frequent occurrence that we will praise VS so fulsomely but this campaign has been a long time coming but for it to work needs buy in from the bottom up now; not just the top down. "Being one of the nation’s most important tourism drivers, events have a massive part to play in the campaign and EventScotland is calling on the industry to take part in creating a new social movement, which will reverberate globally. From today, we’re asking you to help us show the world what the Spirit of Scotland means to you. We’re asking, simply, “Have you #ScotSpirit?” In return we want you to show us how your company or event identifies with one of seven distinct ‘Spirits’ which we think comprise the Spirit of Scotland. These are Determination, Humour, Spark, Soul, Guts, Fun and Warmth. Whether sharing an image that relates to these, or describing the very moment that you feel #ScotSpirit, we would love for you to be a part of this new mass collaboration. All you have to do is post or tweet what #ScotSpirit means to you on social media, using the #ScotSpirit hashtag, and you will potentially be engaging with the many thousands of people we are confident will become exposed to the campaign. As well as sharing the most imaginative content with our worldwide followers via our social media channels, we will also be highlighting the ‘Spirit of Scotland’ through TV, radio and print marketing activity in key markets around the world. This, we are confident, will help to generate overwhelming interest in Scotland and promote the #ScotSpirit movement, encouraging more visits to Scotland, as well as our many wonderful events. By becoming involved, you can benefit from the support of this campaign and, potentially, bring your event to a wider audience than ever before." We hope that all of you are planning on a wee romantic weekend ahead. Some are clearly pushing it a little with a weekend in Cardiff with their partners and oh, yeah a ticket for the rugby! However you spend it we hope it's a pleasant one. One of our longer term clients, Executive Golf and Leisure in Bridge of Allan have been messaging their clients this week through their ConstantContact newsletter with a slightly amended logo that Steven in the office ran up for them! Like all lasting relationships you have to keep it personal! Research indicates that most visitors know what they are looking for when they hit your website so the trick is ensuring that they can get to where they want to be quickly by removing frustration and preventing the visitor from leaving the site to another that’s easier to use. It shouldn’t be complicated to design a structure that works and flows for the user. Identify the elements they are looking for and make it easy for those elements to be found and utilised. The key is to make it easy for the guest to find what they are looking for and execute quickly. Easy to access booking buttons; promotional offers and news; easy navigation and of course strong introductory content and imagery that increases the volume of the call to action. However can you put too much on your homepage? Can we use Pop Ups, Lightboxes or Hovers? One of the most requested functions when designing landing pages is the inclusion of what would commonly be called a “pop up” (although it may actually be a lightbox or Hover area.) There is no doubt that pop out or pop up boxes have a role to play and we use them frequently for functions such as newsletter sign ups or Booking engine requests. In both of these examples however the pop up is triggered by a definite click by the user because that is what they are looking for. The pop ups to be thought twice about are those that simply appear over the top of your homepage every time it loads. To many users they jump out like annoying adverts and for many they are annoying and in the way. We would normally advise against using them. There may be no definitive evidence but the user is not overly fond of pop ups and there are plenty of other ways to engage the customer. Again all of our sites come with the ability to add and update feature boxes (similar to newspaper puff boxes or “tiles”) directing the user to your featured content. You can update the graphics, title, sub title and link once again. These can provide the quick links and reduce friction for changeable content. We advocate calls to action at the foot of all content pages to ensure that your site visitor has somewhere to go should they be interested in what they have read – calls to cation could be Book Now, Contact Us, Download Brochure or any redirect to internal or external links. All our sites are designed where graphic buttons are automatically created for these links giving more prominence to your calls for action. It is a personal opinion but we try to avoid too many moving parts on a homepage. Too many sites look like a Sky Sports page with main images being overlaid by two speed ticker tapes at the bottom, moving features on the right, sliders at the bottom and pop ups jumping up all over the place. The brain cannot process the overload. 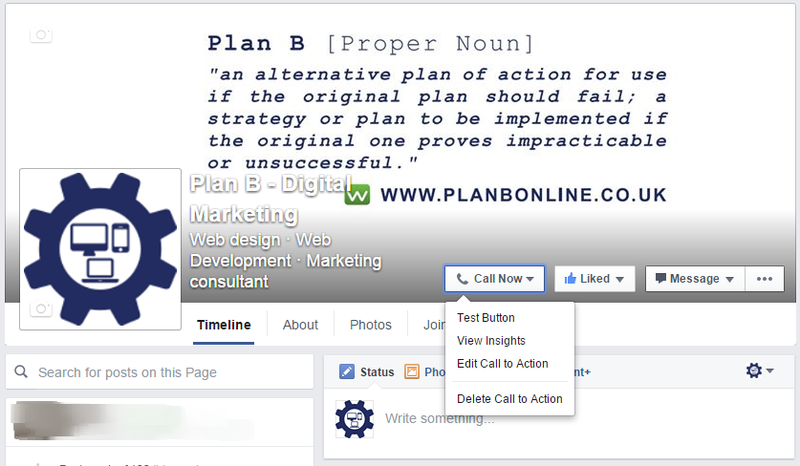 Position your key calls to action where they can be seen and clicked and avoid cluttering. Just because you’ve seen something on another big name website does not mean it is always best practice. Apply your own logic and see everything from the customers’ point of view first.